If you think GM only makes cars you are wrong. GM and NASA have a long history of working together on various space projects since 1960s. 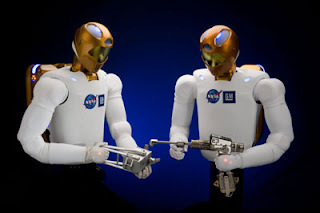 Engineers from NASA and GM in collaboration with the help of Engineers from Oceaneering Space Systems are developing a highly advance Humanoid Robot by the name Robonaut 2 also called R2. It is much more advance than its older version Robonaut, it will be capable of working alongside humans in various environments ranging from space to industries. The Robot uses high end control, sensor and vision technologies which makes it more capable of doing human like movements. Its more capable of doing things than any other robot made before. The basic goal which GM and NASA want to achieve through this project is to develop a Robot capable of performing repetitive, ergonomically challenging and dangerous tasks. GM says, the technologies developed for Robonaut will help make cars and assembly lines more safe. For NASA such kind of robot could be send along with astronauts in space for performing basic and simple task like setting up equipments and performing dangerous tasks like exploration and construction in hazardous environments. As far as Specification go it weighs around 300lbs and can lift weights of upto 20lbs. Robonaut will probably be the stepping stone for humanoid robot technology.